Lack of efficient HR within your practice can leave your business vulnerable and open to employee disputes, disciplinaries or grievances. Many clients we work with find themselves in difficult situations with employees when there is no consistent approach to managing staff. Check all job descriptions are relevant and up to date: ensure your staff are executing the job they have been hired to do. If they have taken on additional roles and responsibilities, job descriptions must be updated to reflect this. Having accurate job descriptions will allow you to monitor and review their performance throughout the year. Audit your pay structure: in many cases we find that employees performing the same role are often being paid hugely different salaries due to length of service, or other factors. If this becomes public knowledge within your business it can lead to low morale, employee disputes and worst-case scenario, a grievance against your business for discrimination. Implement a performance review or appraisal structure: this allows you to track employee performance which has a knock-on effect to your business. It can also be used during CQC or HIW inspections to evidence you are developing and managing your staff efficiently. There are many ways to track and measure performance – read our blogs on appraisals for more help. Introduce a company handbook: this should contain your HR policies and procedures relating to everything from sickness and absence to maternity and grievances. This ensures that staff are all adhering to the same rules and will protect your business in the long run if you have set out your business guidelines from the outset. Hold regular one to ones with staff to address issues as they arise and communicate updates in the practice. Deal with issues as they arise first informally, and then formally if necessary. 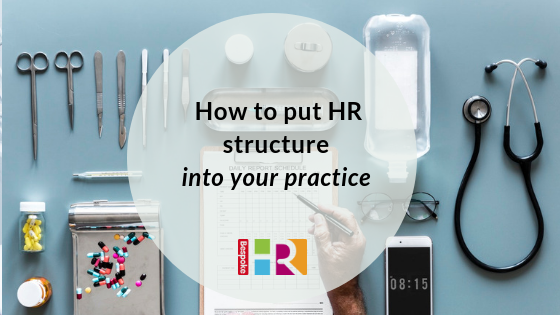 For advice or an informal chat about how to implement an HR structure into your business, get in touch.